On March 23, at Rose Music Hall, three brothers bonded by blood and united by the awesome force of rock n’ roll came to Columbia, Mo. 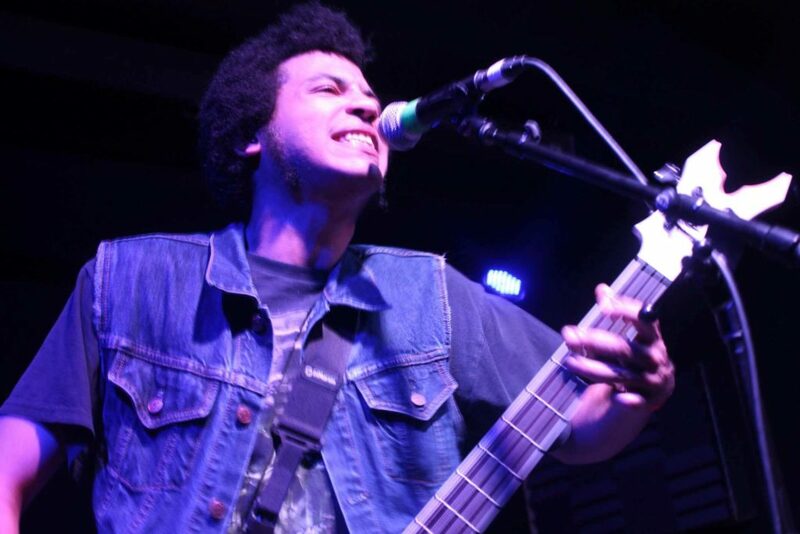 The band is Radkey, featuring Isaiah Radke on bass, Solomon Radke on drums and Dee Radke on guitar and lead vocals. This band has serious talent, serious musical chops, and they wear their influences on their sleeves – it’s omnipresent. Influences from the Ramones, the Misfits, Bad Brains, Nirvana – it can all be heard and more with Radkey. However, their sound is not a blatant rip-off – they take these influences swirl them around and serve up their own potent, powerful punk rock cocktail. Radkey came to be in 2010, in St. Joseph, Mo. and have since relocated to Kansas City. Their first show was opening up for Fishbone in 2011. From there, doors started opening, opening up for The Offspring and the Descendents, playing SXSW in Austin and the Afro Punk festival in New York , as well as excursions to Europe and Japan. This spring found Radkey on a headlining tour. The night before they came to Columbia, they had kicked off the tour in Lawrence, Kan. at the Bottleneck, with The Bad Ideas and Wick & The Tricks also on the bill for that night. The strongest bolts of audio electricity were being thrown at the audience for the entirety of Radkey’s set, which seemed to be a little over an hour. 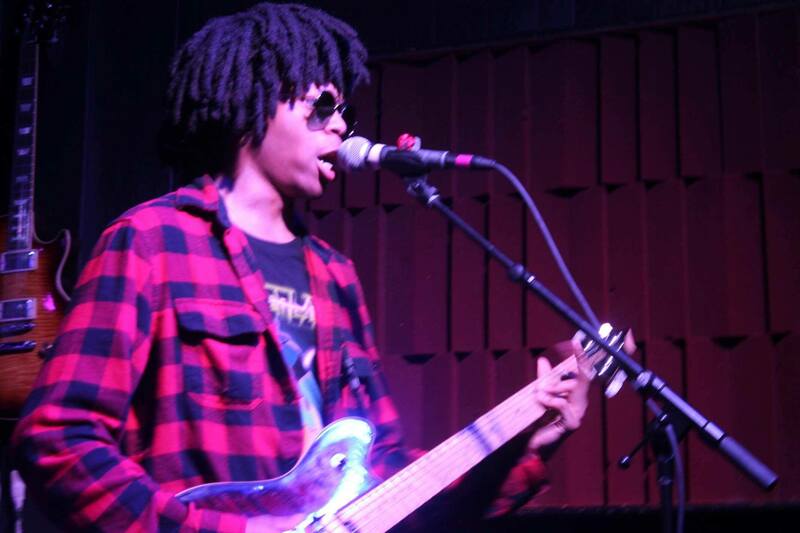 Radkey took a page from the book of the Ramones, as there wasn’t a lot of banter between songs – it was one song into the next. All members looked as if they loved being on stage, with a noticeable synergy present between the three. Dee looked like he was just born with an entrenched sense of cool, with shades on his face for the entirety of the set. Throughout most of it, he stood in one spot, looking cooler than cool. He occasionally moved from his perched spot of stage to drop to his knees on a solo while pointing his guitar to the heavens. Isaiah Radke came off like equal parts Phil Lynott and Dee Dee Ramone and was the perfect complement to Dee. Isaiah was all over the stage, taking steps backward and forward, looking like a drunken, stumbling cha-cha, but looking completely intentional and in control the entire time. He was so overcome by the power of the music, he did a couple of on stage jumps. The music inspires such a response. It’s laced with up-tempo energy. So many variations within punk rock exist, sub-genres within genres, etc. Radkey might not be reinventing the wheel, but the auditory cocktail they serve up is distinctively and unmistakably their own. Jagged down strokes, solos that sound like they could fit on “ I Against I” (or any Bad Brains record for that matter), caffeinated heartbeat drum fills, baritone vocals that are perfectly on key, sing-a-long hooks and melodies, yet never dipping into the ultra-syrupy territory of pop-punk. The crowd of about 100 strong or so seemed to be fully aware of the musical treat they had received when Radkey was on stage. The joy in the room was contagious, hand clapping, foot stamping, a few mosh pits breaking out and a barrage of smiling faces. I was awed throughout the night. I thought “why is it I’ve only recently found out about this band.” Maybe only four to six weeks before the show I had first heard Radkey. It was upon the release of their single “P.A.W.” I started listening to them. The song deals with a heavy subject, racism, discrimination and race-based misjudgments. None of these things are mentioned directly by name – the lyrics are esoteric. A general sense of estrangement within the song could potentially be transferred to and understood by anyone listening. In my book, some of the best song lyrics are able to take the personal and turn it into the universal. “P.A.W.” was a part of their set when Radkey came to Columbia. To my delight, many of the songs they played were from the “Delicious Rock Noise” album of 2016, which I bought the week of the show. They launched into “Romance Dawn,” “Love Spills,” “Evil Doer,” “Glore” Closer towards the end of the show was “Dark Black Makeup,” the first song on “Delicious Rock Noise” and one of my favorites on the album. Radkey brought the house down with “Teen Titans Theme” the last song on “Delicious Rock Noise.” Chants for an encore were met with the band doing a few more. After the show, Jackson Browne’s “The Load-Out” came on the PA – having the night end this way, as I ordered a Boulevard Pale Ale and got ready to leave, seemed picture perfect, like something out of a movie, all of that amped up adrenaline being followed by such a mellow and reflective song floating through the air. I walked out of Rose Music Hall into the night air of downtown Columbia feeling fully alive. If anyone tells you that punk is dead and there is no more exciting, innovative, young rock music being made in this day and age, point said jackass in the direction of Radkey. For more, follow Radkey on Facebook here.